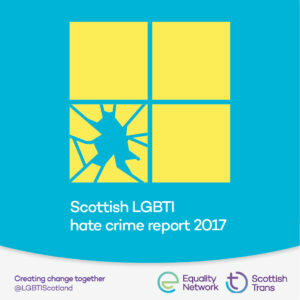 The Scottish LGBTI Hate Crime Report is Scotland’s most comprehensive study of hate crime against LGBTI people. Based on a detailed survey of 1,445 people in Scotland, the report reveals shocking statistics – click here to read a PDF copy of the report. (To order printed copies please use the form at the bottom of this page). The report was published in October 2017, in advance of National Hate Crime Awareness Week which runs between 14th-21st October. • 66% of gay male respondents had been a target of a hate crime. • 53% of bisexual respondents had been a target of a hate crime. • 80% of trans respondents had been a target of a hate crime. been a target of a hate crime. experienced hate crime more than ten times. abuse (36%) and sexual assault (21%). pub or café, and public transport. LGBTI awareness from police officers. with the interaction they had with the PF. 51% were dissatisfied. communication, as well as perceived lack of support from the PF. education would be more effective than a sentence like a fine. safer, while 30% said this had not made them feel safer. Although the report makes for difficult reading, the Equality Network hope that people will find it informative and useful, and together, we can work in tackling all forms of hate crime. In the report there are a range of recommendations to ensure better responses to hate crime, to encourage reporting of hate crimes to police, and to prevent hate crime from happening in the first place. The Equality Network would like to thank all of the individuals who participated in the survey, for taking the time to share their experiences and views. Their contributions will help to inform thework of the Equality Network and the Scottish Trans Alliance to improve the handling of hate crime in Scotland. If you want to speak to a specially trained LGBTI Liaison Police Officer, you can request to do so. You can also ask that you are visited by officers in plain clothes if you prefer, and if you feel safer meeting somewhere other than your home, a local library for example, the police can arrange this for you. Please complete this form to order published copies of The Scottish LGBTI Hate Crime Report.